There’s more than one way to put together and play a 7th chord shape on the guitar. Here are a few m7 examples, namely variations on the open Em7 and Am7 forms. Expect to see these shapes used elsewhere on the fretboard as full or partial barre chords. To understand why these variations work, look at the intervals to see how they appear in multiple locations. The following songs all feature some type of maj7 chord. As you work through the song lists, keep in mind that some examples may include other types of chords in addition to the chords that pertain to the particular list. You may want to revisit the songs in each list later. The three major chords in the major scale occur on the 1st, 4th, and 5th scale degrees. You know these chords by number as I, IV, and V. In the key of G, these chords are G, C, and D. You may expect them all to make similar major 7th chords, but they don’t. G and C have a major 7th, but D has a flat or minor 7th. A major triad with a minor 7th is technically called a dominant 7th, but, and this is where things get confusing, it’s simply referred to as a 7th. You always have to specify major 7th chords as maj7, but you can simply use “7” to label dominant 7ths. In other words, if a 7 by itself follows a letter name, then that chord is dominant (a major triad with a minor 7th). So in the G major scale, the three major chords with 7ths become Gmaj7, Cmaj7, and D7. The dominant 7th chord naturally occurs on chord V in the major scale. 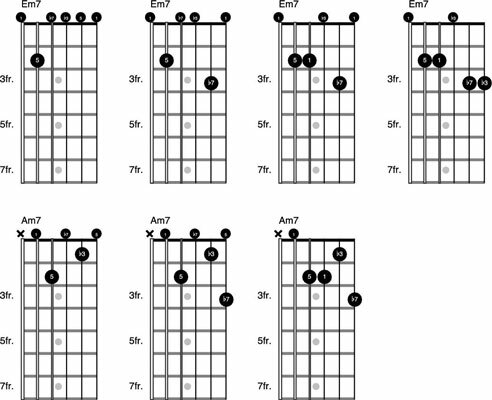 Dominant 7th chords are extremely common in music. You see some of the most popular forms along with their intervals here. 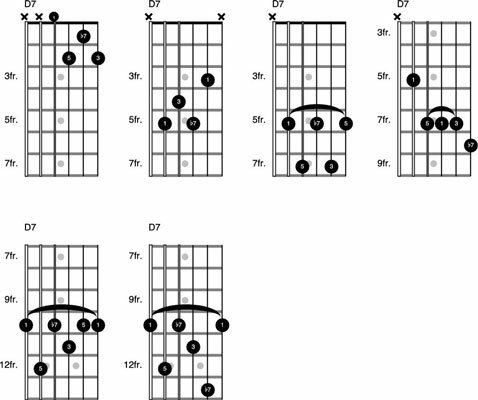 Keep in mind that you can move these shapes around to produce dominant 7th chords for other notes. The 7th scale degree produces a chord that requires a little extra explanation. As a triad, it has a root, 3rd, and f5th; it’s called a minor f5. Add a 7th and it becomes a minor 7f5. For example, the Fs in the G major scale becomes Fsm7f5. You can also call the minor f5 a diminished triad, because a f5th is also called a diminished 5th. Add a 7th and it becomes a half-diminished chord. So Fsm7f5 can also be called Fs half diminished (Fs’). Why is it only half diminished? Because a fully diminished chord, also called a diminished 7th, actually has a double flat 7th (ff7). For now, keep in mind that a diminished triad and a full diminished chord are not completely the same thing. The following songs feature a m7f5 chord (that is, half diminished). Some of them have other types of 7 chords mixed in, too.